Dental caries is one among the most prevailing infectious diseases among children. Poor oral hygiene, improper feeding habits, and lack of awareness among parents are the main factors responsible for such prevalence. Moreover, the comparatively smaller tooth structure of primary teeth leads to speedy involvement and loss of the tooth structure in terms of surface area. Managing children in dental chair is a task that a pediatric dentist specializes in but at the same time lack of cognitive development and understanding capacity in children sometimes makes it difficult to make the child cooperate for lengthy treatment. Loss of crown structure in the primary anterior teeth poses an esthetic challenge for a pediatric dentist. Lot of newer advancement such as zirconia crowns has made its way to the limelight, but their high cost still remains a pressing factor among the middle-class population. In such cases, resin composite restoration becomes the treatment of choice. As placement of direct resin composite restorations is a technique-sensitive procedure, it requires patient cooperation, careful isolation, and time of the operating field., With indirect composite shell crowns, these complexities can be avoided. 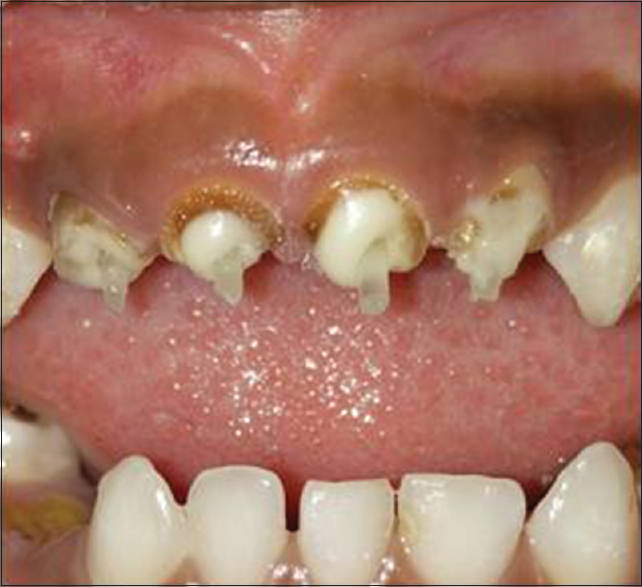 In a 5-year clinical study, Ulvestad in 1987 reported on the durability and function of resin crowns., The following case report describes the placement of a chairside-fabricated composite shell crowns for grossly decayed multiple anterior teeth. 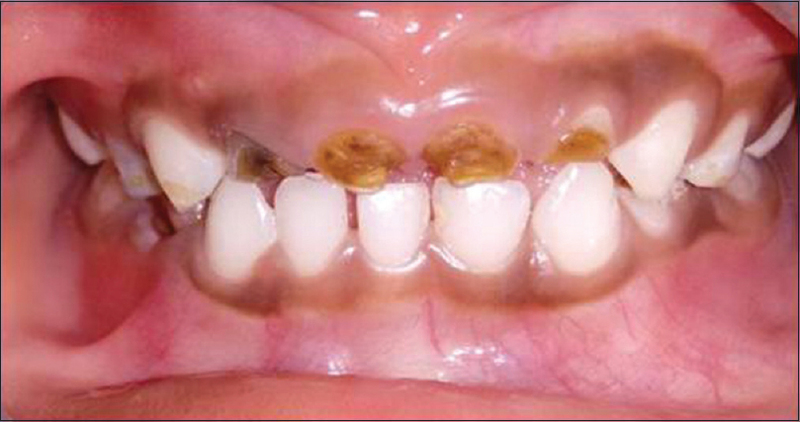 A 5-year-old male patient reported to the department with early childhood caries affecting the maxillary anterior teeth [Figure 1]. After a thorough clinical examination, deep dentinal caries was seen in 55, 54, 52, 51, 61, 62, 75, 84, and 85. Radiographic investigation showed pulpal involvement in 51, 52, 61, 62, 75 and 85. Teeth 54 and 84 were grossly decayed, and hence, extraction followed by band and loop space maintainer was given. After pulpectomy in 51, 52, 61, and 62, fiber post was given as there was lack of crown structure and core build-up was done with dual-cure composite resin [Figure 2]. Pulpectomy followed by stainless steel crowns was given in 75 and 85 and 55 was restored with type IX glass ionomer cement. Maxillary and mandibular arch impressions were made with irreversible hydrocolloid alginate impression material. Impressions were poured with dental stone and casts were made. After pouring the impression, the cast is allowed to set. Double coating of the separating media was applied to create space for luting cement. Composite resin build-up was done on 52, 51, 61, and 62 on the cast and occlusion was checked in relation with the mandibular anterior teeth such that it acts as the core of the anterior teeth followed by curing [Figure 3]. As it forms a complete shell-like structure over the affected teeth, it is called as composite shell crown. After completion of indirect restoration on all the teeth, the shell crowns were finished and polished [Figure 4]. The shell crowns were ready to be cemented. The teeth to be restored were etched, rinsed, dried, and followed by application of bonding agent and curing. The fabricated shell crowns were filled with dual-cure flowable luting resin and placed intraorally on the maxillary anterior teeth. Excess luting resin was removed carefully with a probe. Light curing was done individually over each shell crown labially as well as lingually [Figure 5]. Parents and the patient were given proper dietary and oral hygiene advice, and periodic recall was maintained at the interval of 3 months. It remains a challenge for the pediatric dentists to restore severely carious anterior permanent teeth. The aim of pediatric restorative dentistry is to restore the damaged teeth to maintain normal function and esthetics. 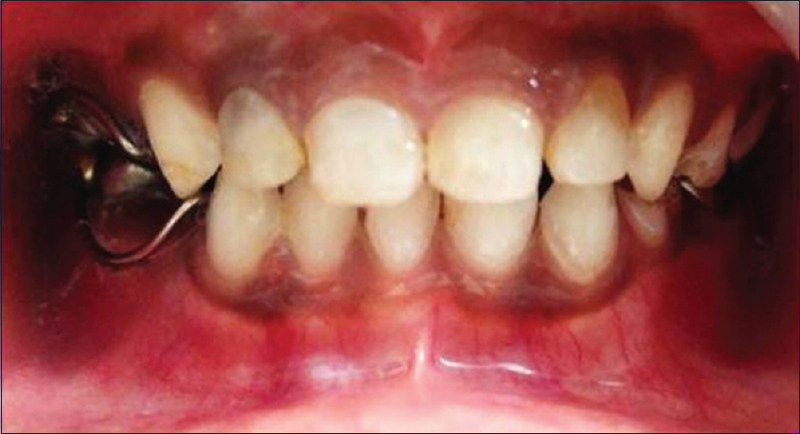 The absence of tooth structure, limited availability of techniques and materials, poor adhesion of bonding agent to primary teeth, and uncooperative children for whom these restorations are needed make these treatments difficult, with high rate of failure. Intracanal retainers after endodontic treatment is necessary to get retention and provide stability for such reconstructed crowns. Direct and indirect composite, strip crowns, polycarbonate crowns, zirconia crowns, open-faced strip crowns, and acrylic crowns are the various treatment options available for restoring primary anterior teeth. Although multiple treatment options are available in children for esthetic rehabilitation, most of these options are technique sensitive., Moreover, few of them such as zirconia crowns also require subgingival preparations and isolation and hemorrhage control in children becomes difficult. In the present case, cost factor was a major issue and a less costly treatment plan had to be decided. The use of preformed, composite shell crowns reduces the cost as well as can result in a more durable, esthetic, and functional restoration for pediatric patients. Composite resin materials have shown the best strength, wear resistance, esthetics, and color-matching abilities of all the materials and are often the first choice of many clinicians for restoring anterior teeth. Although a lot of treatment options are available, the beauty of the esthetic crown will depend on the clinician's knowledge, child's behavior, and retention of the crown and proper maintenance of the oral hygiene. The technique described in this case report is simple, requires minimal compliance from the child, is less technique sensitive, and can be completed in an accepted chairside time. Although composite shell crowns might not have as high strength as zirconia crowns but with proper home care and regular follow-up, this can be a cost-effective option for primary anterior restoration. Webber DL, Epstein NB, Wong JW, Tsamtsouris A. A method of restoring primary anterior teeth with the aid of a celluloid crown form and composite resins. Pediatr Dent 1979;1:244-6. Miller MB. Indirect Resin Systems. 13th ed., Vol. 1. Houston: Reality Publishing Co.; 1999. p. 328-32. Fahl Júnior N. The direct/indirect composite resin veneers: A case report. Pract Periodontics Aesthet Dent 1996;8:627-38. Ulvestad H. A 5-year evaluation of semipermanent composite resin crowns. Scand J Dent Res 1978;86:163-8. Garlisi NW. Clinical evaluations-artglass. Dent Advisor 1999;16:11. Usha M, Deepak V, Venkat S, Gargi M. Treatment of severely mutilated incisors: A challenge to the pedodontist. J Indian Soc Pedod Prev Dent 2007;25, Suppl S1:34-6. Waggoner WF. Anterior crowns for primary anterior teeth: An evidence based assessment of the literature. Eur Arch Paediatr Dent 2006;7:53-7. Carranza F, García-Godoy F. Esthetic restoration of primary incisors. Am J Dent 1999;12:55-8. Updyke J, Sneed WD. 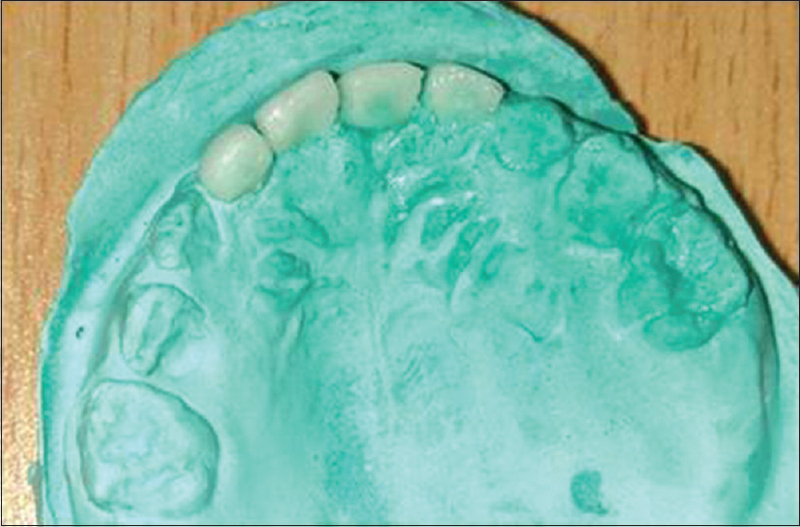 Placement of a preformed indirect resin composite shell crown: A case report. Pediatr Dent 2001;23:143-4. Waggoner WF. Restoring primary anterior teeth. Pediatr Dent 2002;24:511-6. Anuradha K, Bargale S, Shah S, Ardeshana A. Esthetic crowns in primary dentition reestablishing the innocent smile. J Adv Med Dent Sci Res 2015;3:46-52.